The building of Garrick’s Temple in the riverside gardens of his villa is noted in the piece on David Garrick and Garrick’s Villa. In 1923, anxious to reduce her responsibilities, the owner of the Garrick Estate sold the Temple Lawn, thus divorcing the Temple from the Villa. The purchaser, a Mr Paul Glaize, then owner of a house-boat moored at Taggs Island, proceeded to build a house adjoining the Temple itself. Feeling ran so high, however, that in 1932, Hampton Urban District Council bought the site, demolished the house and converted the lawn for public recreation. During the Second World War, the Temple was an ARP Warden's post. After the war public use extended to social gatherings and minor, or even major, cultural events. Memorably, in 1959, the lawn formed a backdrop for a Handel bi-centenary concert given by The Goldsbrough Orchestra, seated on the house-boat Astoria. The audience attended in boats, the Water Music was played, and also the Fireworks Music, which was accompanied by a magnificent display of fireworks. In 1963 Alderman Edward Bostock presented Twickenham Council with a plan for Hampton and its riverside. Nothing came of this but subsequently Hampton Residents' Chairman, Gerald Heath, suggested Conservation Area. At this point it was hoped that the tunnel might provide an underground walkway to enable the public to have easy access to the public lawns but, for a variety of reasons, this did not come about. In 1977, after vandals had stolen the lead from the cupola, Richmond upon Thames Council commissioned Donald Insall Associates to oversee the repair of the Temple roof. This was followed by further occasional use of the building for small scale public events, memorably a celebration of Garrick on the bi-centenary of his death in 1979, when Bamber Gascoigne welcomed the actor Marius Goring who recited appropriately and planted a small tree, anointing its roots with Stratford water. By the mid 1990s the Temple was once again in serious need of repair and the garden sadly neglected. Much indignation prevailed and at last, in 1996/7, the Council applied, successfully, for a Heritage Lottery Grant to help with restoration. Partners in the Project were the Thames Landscape Strategy, the Hampton Riverside Trust and, crucially, The Temple Trust, an organisation founded to rescue small 18th century garden buildings. The Temple was no longer to be left as an empty shell. 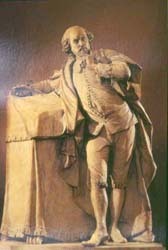 To everyone's delight a replica of the Roubiliac statue of Shakespeare was provided by the British Museum and an interpretation of Garrick's life devised and hung by Suzannah Fleming of the Temple Trust. Local volunteers undertook keyholding, stewarding and some caretaking duties on a regular basis. This time the future was not left to chance as the Temple Trust set up a Preservation Fund to help the Council with future maintenance. The building was opened to the public by the end of 1998 and the site re-landscaped and replanted in the spring of 1999 to replicate something of its appearance in Garrick's day. The audience attended in boats, the Water Music was played, and also the Fireworks Music, which was accompanied by a magnificent display of fireworks.